Lenders are allowing more short sales by financially strapped homeowners and a few people are even getting cash to complete the sale. A sold sign outside a Cincinnati home. Short sales are when lenders allow borrowers to sell homes for less than their unpaid mortgages. They are an alternative to foreclosures. Short sales have been increasing for months, but the financial incentives — which Realtors say are random and infrequent — are a newer wrinkle. 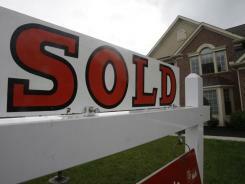 •JPMorgan Chase went national with short-sale incentive offers last year, paying up to $35,000 in some cases. •Bank of America is testing incentives from $5,000 to $25,000 in Florida to see if they should be expanded to more states. The Florida program began last fall, spokesman Richard Simon says. •Wells Fargo‘s incentive offers range from less than $3,000 to $20,000, spokesman James Hines says. Short sales, even with incentive payments to borrowers, can save lenders money compared with the expenses involved in completing foreclosures. In states such as Florida where foreclosures go through the courts, 50% of loans in foreclosure are more than two years past due, says a January report by mortgage tracker LPS Applied Analytics. “It’s a lot cheaper to shell out $10,000 or $20,000 to someone than it is to go through a long foreclosure,” says Jim Gillespie, chief executive of Coldwell Banker. Banks are more willing to do short sales now than in the past, Gillespie says. Cash incentives appear to be “limited but increasing” in number, he adds. “When a loan modification isn’t possible, a short sale may be a better and faster solution” than foreclosure, says JPMorgan Chase spokesman Thomas Kelly. The lenders won’t say how often they extend such incentives. Typically, short sale incentives are more common for loans in states where foreclosures take more time, Hines says. In November, short sales accounted for more than 9% of single family home sales and were up 32% from the year before, according to CoreLogic. Market researcher Dataquick also shows short sales increasing from January 2011 through last month throughout California and in Phoenix, Miami and Seattle. The federal government-run foreclosure prevention program also offers short sale incentives, at least $3,000 for sellers, but far more short sales are being done outside the government program. Through December, just 26,901 short sales had been completed through the Home Affordable Foreclosure Alternative (HAFA) program. In contrast, BofA, the largest servicer of home loans, did 107,000 short sales last year. That was up from 92,000 in 2010, which was double the 2009 volume, it says. “The trend is up,” says Moody’s Investors Service analyst William Fricke.